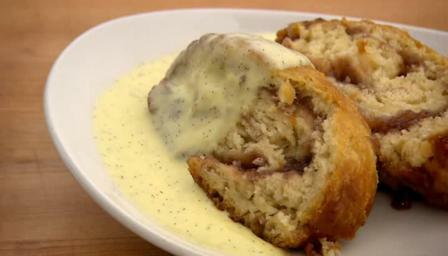 Try The Hairy Bikers’ recipe for a homemade version of this childhood classic. Serve with plenty of custard. Preheat the oven to 200C/400F/Gas 6. Butter a large sheet of greaseproof paper and set aside. Stir the flour, suet, sugar and salt in a large bowl until well combined. Slowly stir in the milk or water to form a soft, spongy dough. Tip the dough out onto a floured surface and knead for a few minutes. Roll the dough out to a 22cm x 32cm/8½in x 13in rectangle. Spread the jam onto the dough, leaving a 1.5cm/½in border. Gently roll the dough up from the short end and transfer to the greaseproof paper, seam-side down. Wrap the roly poly in the greaseproof paper, making a long pleat in the parchment to allow the pudding to expand as it cooks. Twist the ends of the parchment like a Christmas cracker and tie tightly with kitchen string, to seal the pudding inside. Repeat the process with a large piece of aluminium foil. Place the pudding onto a roasting rack set on a roasting tin. Pour boiling water into the roasting tin until the half full. Remove the pudding from the oven, unwrap the aluminium foil, then snip the string and unwrap the paper. The pudding should be well risen and lightly browned in places. Don’t worry if the jam has made its way through to the outside of the pudding a little – it will taste all the more delicious. Put on a board or serving plate and cut into thick slices. Serve with lots of hot custard or cream.